CHRISTMAS GREAT GAME. One gift everyday + 1 surprise on December 26th. Let’s tweet! Every year, the renowned french company Fnac (which sells cultural and high-tech products worldwide) generously reward its community for Christmas by offering one gift everyday for a month, through a game contest. Since mid-2017, Fnac uses the Like a Bird platform to manage its recurring operations. Therefore, they chose to work on the same platform to organize their huge Christmas operation. To this end, the social media team chose to set up a Tweet Draw. By asking its community to tweet #FnacEnvoieDuKdo while mentioning the account @Fnac, the company offered a huge visibility to its hashtag. GAME CONTEST: Do you need a new computer? Try to win a #PC @HP Spectre Laptop. 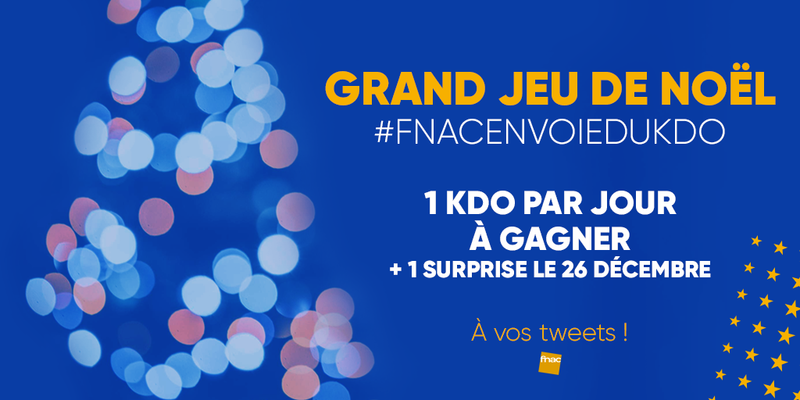 To participate, follow @Fnac and answer this tweet with the hashtag #FnacEnvoieDuKdo. Therefore, Fnac was able to configure 25 random draws upstream while having an overall and clear vision of its Christmas operation, thanks to the detailed statistics data provided for each random draw. “The perfect tool to set up a game contest with a few clicks and to engage your communities! All of our Twitter game contests are managed on the platform, we can create an operation with a few clicks! Like a Bird is really easy to use, in 5 minutes we can select the mechanism we want (RT, follow, Instant-Win…) that will allow us to engage our community at most and to recruit new followers! Sébastien had configured 23 Tweet Draw operations upstream and only had to set the daily random draws. He chose to activate the Mandatory Follow option throughout the duration of the operation, which allowed him to get more than 3,200 new followers! Over 1,5 million views: no sponsoring!